Background: Latenight Weeknight Records joins forces with Plastic Sound Supply to release Brim Liski's latest release, The Repetitions EP, available now. 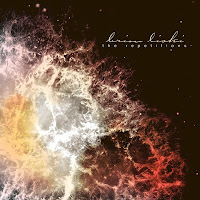 Comprised of members from A Shoreline Dream (USA), CacheFlowe (USA) and Jap Jap (Netherlands), Brim Liski began as an asynchronous and eclectic trans-continental studio project. Recording in each others' studios over the past 5 years, the 3 producers have collaborated in multiple capacities, with the result sitting plainly between their unique styles as an audio Venn diagram. The end of 2011 saw the group take their sound to the stage, with two guitars, vocals, synthesizers, laptop beats and custom audio-reactive visuals. The Repetitions is a cinematic, shoegaze and electronic sound inspired by the cosmos. With driving electronic beats as the foundation beneath layers of reverb-drenched guitars, synths and vocals, the recordings convey the steady beauty of cosmic destruction and rebirth.